Matlock boss Dave Frecklington hopes that the Gladiators’ meteoric rise up the Evo-Stik NPL Premier Division table does not hit the buffers with his side having a blank Saturday this weekend. Town extended their unbeaten run to ten matches and turned just one point into three with two dramatic injury-time goals to beat Stalybridge Celtic at the Proctor Cars Stadium last weekend but are now left kicking their heels until they travel to South Shields next weekend. 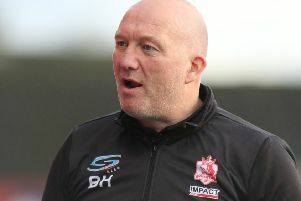 “It’s really frustrating,” Frecklington admitted as he reflected on missing out on another opportunity to lengthen that sequence with Saturday’s scheduled home match with Basford United being postponed due to the Nottingham based club’s progress in the FA Trophy. “Basford would have been another good game for us against a very good side. The 3-1 win against Stalybridge was a scoreline reversal of the earlier league game at the Bower Fold in September and after their narrow defeat at Farsley a week later, Matlock were stuck at rock bottom in the league standings. But just seven weeks later Matlock find themselves in eighth spot and according to Frecklington “ahead of schedule”. “We’re miles ahead of schedule now, to be realistic and honest I was looking at just being out of the bottom six by now and looking towards mid table but it’s been an unbelievable turnaround and that is down to the players who have done everything that’s been asked of them,” he said. “Now it’s important that we all keep our feet on the ground. “We don’t need to go actively looking for new players at present because everyone’s gelled and the run we’ve been on is even more impressive given the injury situation we’ve had with eleven or twelve players being out.